Abraham Lincoln is one of the characters in the 2014 film, The LEGO Movie. Abraham Lincoln was the 16th president of the United States, serving from March 1861 until his assassination in April 1865. He led the United States through its greatest constitutional, military, and moral crisis - the American Civil War - preserving the Union, abolishing slavery, strengthening the national government and modernizing the economy. At present, Lincoln appears on the obverse of the US five dollar bill, and on the same side of the US penny. Abraham Lincoln is a Master Builder in The LEGO Movie. When Vitruvius takes Emmet to speak before the other Master Builders, Abraham Lincoln can be seen in the audience. After the Master Builders lose hope in Emmet, Abraham Lincoln blasts through the ceiling of "the dog" in Cloud Cuckoo Land with his jet-powered chair. 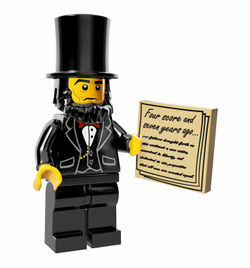 This Abraham Lincoln minifigure uses a few unique pieces: a head with black eyebrows, cheek lines and white pupils, a black rubber hat/beard piece; a torso with a formal jacket with black waistcoat, white shirt, bow tie and pocket watch; and a 2x2 tile piece printed with 'Four score and seven years ago...' on a sheaf of paper. The minifigure is finished off with standard all-black leg pieces. Nicknamed “Honest Abe” because he never borrows anybody’s bricks without giving them back, Abraham Lincoln lives in a log cabin that he built all by himself, in the middle of a forest that he built all by himself, then cut down, and then rebuilt all by himself again. Abraham Lincoln is full of good and fair advice, so his fellow Master Builders often ask him to settle arguments over who gets to build what. He would probably make a great leader, but President Business’s Octan Corporation makes all of the voting machines! As the real-life Abraham Lincoln appears on the US five dollar bill, Abraham Lincoln appeared on the five-dollars-off coupons to new subscribers of the BrickMaster magazine. This page was last edited on 25 January 2016, at 20:46.